The Farmvet app VetIMPRESS provides insights and intelligence for farm vets and precision farmers. Established in 2009 by vet George Brownlee, we witnessed the development of a solution based on a real life problem. And George was the perfect guy to kick off this business idea. 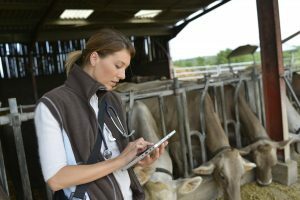 Farmvet, in use by 750 vets around the country, records information on the health, welfare and productivity of farm animals to ensure farms can become more productive and efficient. With a wide-angled view of farm data, the system can also help monitor disease and the use of pharmaceutical products. VetIMPRESS customers, an ever-growing group that now includes pharmaceuticals, food companies and other organizations that leverage farm data, now have access to previously unavailable and unrecorded farm and animal data to create a comprehensive picture of animal health and productivity and better serve their clients. Farmvet is used by the UK’s largest vet practice, OriginAnimal.co.uk. On the public health side of things, Farmvet is working with the University of Bristol’s ‘Antimicrobial Resistance Force,’ and with agencies as far afield as Texas, to bring more clarity to national data on farming. At the individual animal level, the VetImpress system tracks mobility, body condition, heights and weights, and prior health concerns. It takes vets’ inputs on- and off-line and collates it in the cloud alongside pre-existing information such as laboratory data. At a farm level we can then make vital conclusions, such as if a farmer is using 10 times the amount of antibiotics that neighbouring farms are using, it can show him that’s a potential problem. Check out more about George and VetImpress.